Since the recent performance of “Eugene Onegin” (Tchaikovsky) at the Kennedy Center brought up the subject of a dilettante or dandy (a pejorative in the view of George Gilder, for example), I thought I would quickly revisit the 1968 thriller “A Dandy in Aspic”, directed by Thomas Mann and Lawrence Harvey (uncredited), from Columbia Pictures. The only problem is that Karsnevin is the same person. So it’s a setup for artificial schizophrenia. The promo trailer is a documentary about divided Berlin was it was in the mid 1960s (post Kennedy). Note the partying, the tattooing and painting, and the hippy life on the West side, compared to the discipline of the East. Films like this were the rage a few decades a year; they could make public life look eventful without dealing with the moral quandaries of the inequality underneath at a personal level. 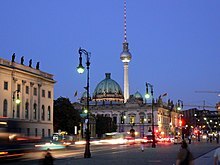 Paul Rosenfels Community associate Rachel Bartlett had lived in Berlin, especially East Berlin, in the late 2000s, and curiously missed how it was before the unification in 1989. Wikipedia attribution link for Berlin picture 2007, under CCSA 3.0.